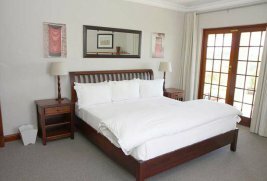 Our Plettenberg Bay Country House is a large Cape Dutch design Guest House which has 4 double luxury bedrooms and 1 double superior luxury bedroom - each with full en-suite bathroom. Full breakfasts and dinners, by arrangement, are served in the alfresco dining room. 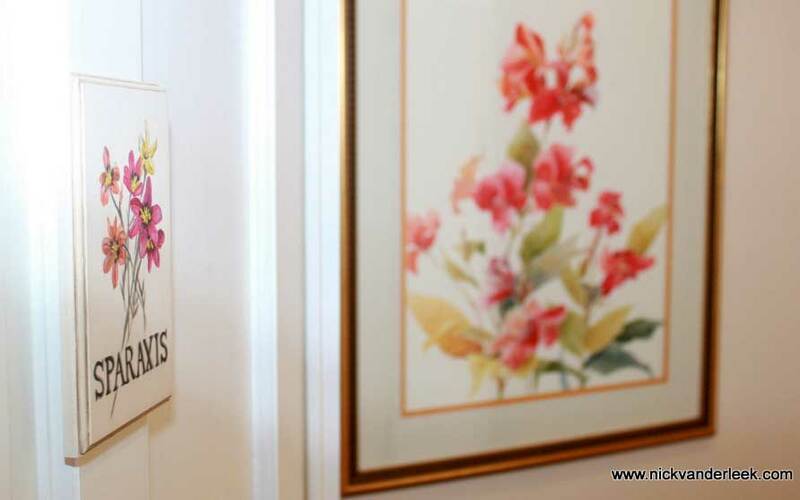 All of the bed and breakfast rooms are named after one of our beautiful indigenous flowers. 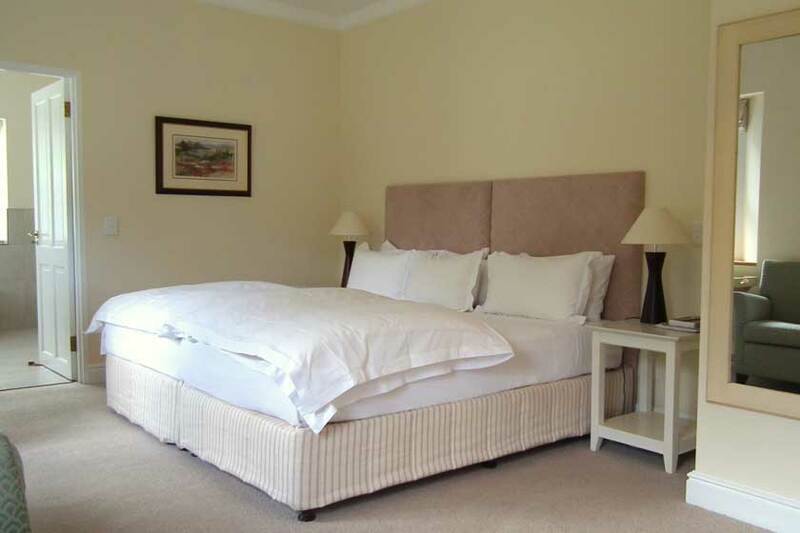 Crassula is a north facing first floor luxury bedroom with a king-size bed and full en suite bathroom. 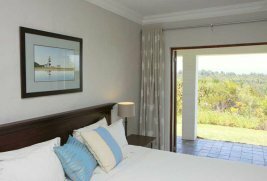 From this bedroom there are beautiful views of the Outeniqua and Tsitsikamma mountains. Lie in bed listening to the dawn chorus of the many Plettenberg Bay bird species. 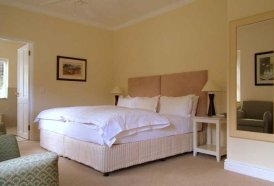 Felicia is a north/west facing first floor luxury bedroom with a king-size bed and full en suite bathroom. 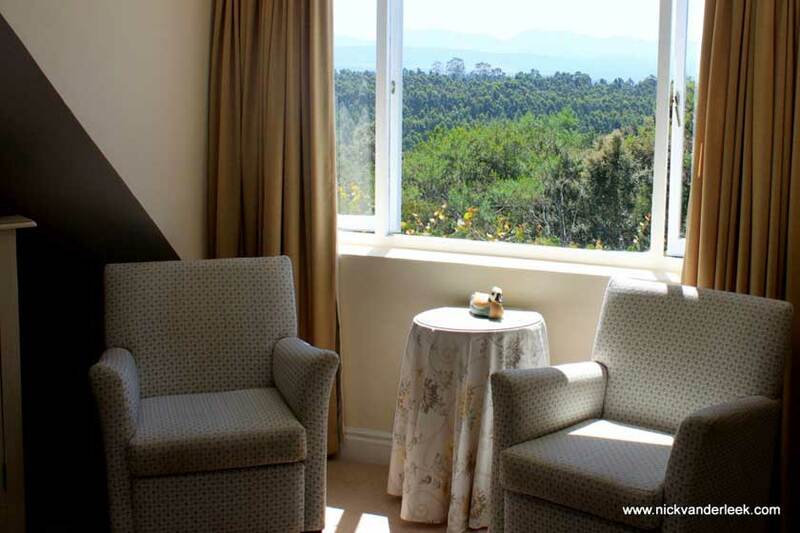 Look out onto the spectacular Outeniqua and Tsitsikamma mountains from your bedroom. Relax on your private balcony and experience the magnificent African sunsets. 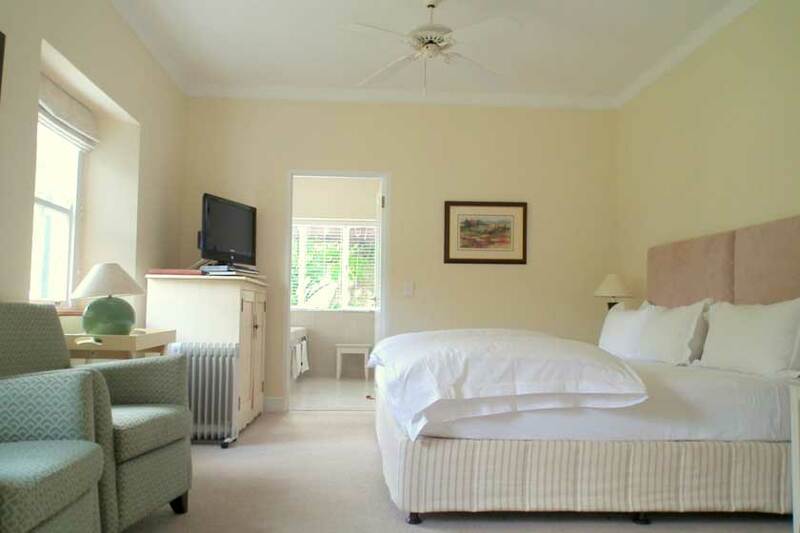 This north facing ground floor superior luxury bedroom, has French doors opening onto a verandah which overlooks our garden. 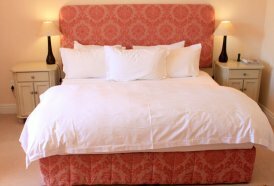 The extra large king-size bed can be made up as 2 three quarter beds if preferred. The en suite bathroom looks into a beautiful en enclosed courtyard. “Tall glossy leafed fynbos shrub, bearing masses of beautiful magenta-pink pea shaped flowers. 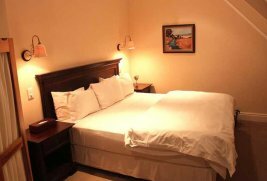 The Polygala room is a south facing ground floor luxury bedroom with an extra large king-size bed that can be made up into 2 three quarter beds if preferred. There is a modern en suite bathroom. Lie back and savour the peace and tranquility of the surrounding fynbos. 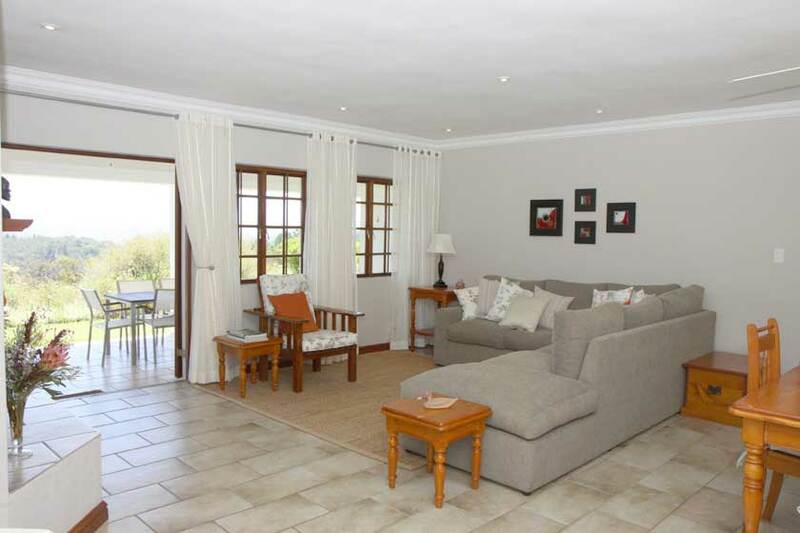 Sparaxis is a charming west facing first floor room. The extra large king-size bed can be made up as 2 three quarter beds if preferred. 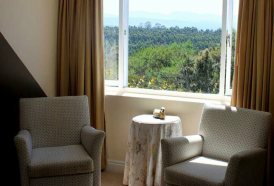 Relax on your private balcony and experience the magnificent African sunsets. 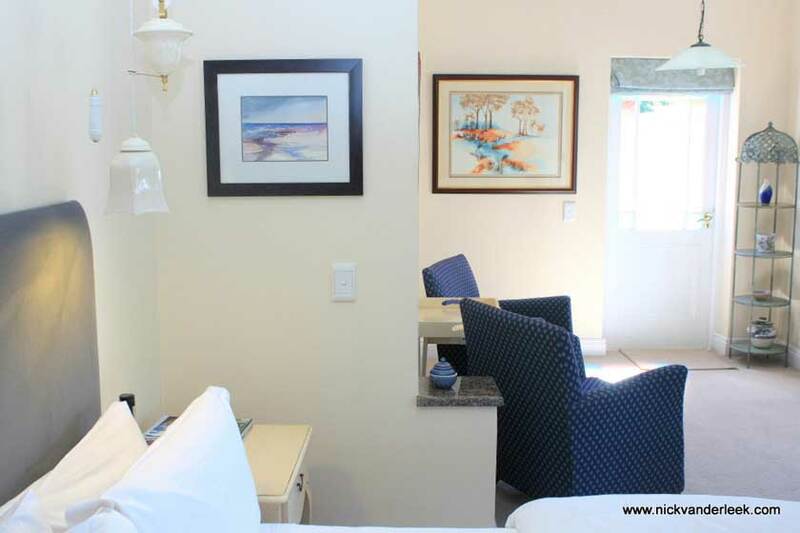 Our Luxury Self Catering Plettenberg Bay Accommodation consists of 1 Studio / Apartment & 3 two-bedroom cottages. 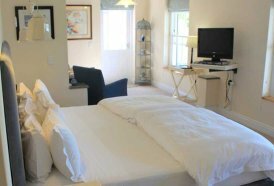 Each spacious Plettenberg Bay Cottage is well equipped, has two bathrooms, and sleeps up to 5 people in luxury and comfort. The Studio / Apartment is a spacious (70 sq. 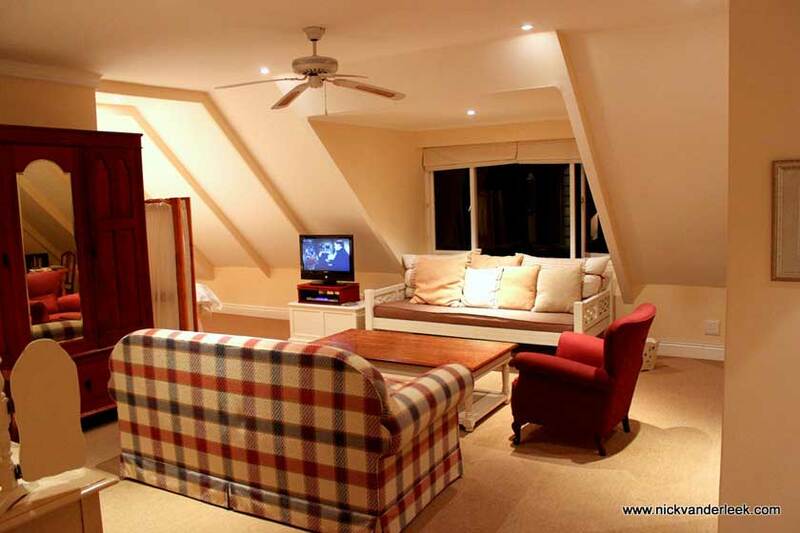 metres) north facing studio/apartment suitable for two guests. 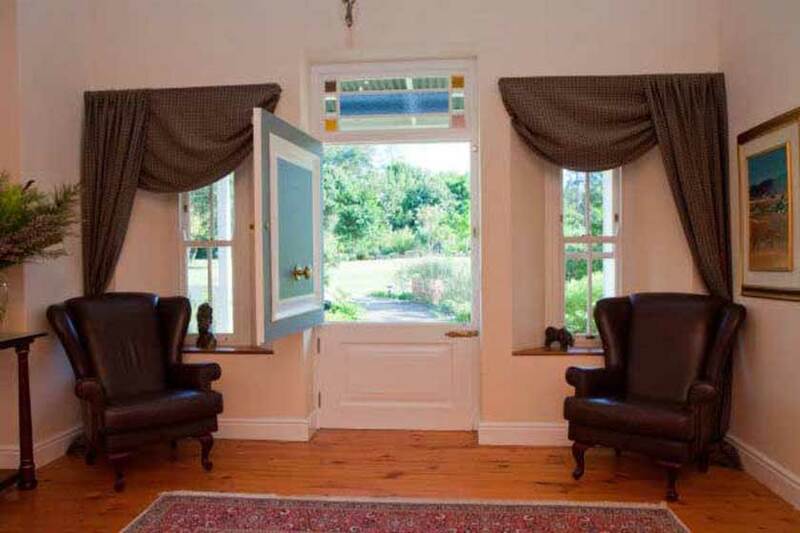 Situated on the first floor of the Country House, it has its own separate entrance and a balcony from which to appreciate the uninterrupted mountain views. There is a well equipped kitchen for the self catering guest, or breakfast and dinner may be enjoyed in the Country House. Apart from the tasteful furnishings, there are log fires in the lounge and main bedroom for the cooler evenings, as well as a private patio with a built-in barbecue. All of our Plettenberg Bay cottages and the studio/apartment are all named after one of our beautiful indigenous flowers. 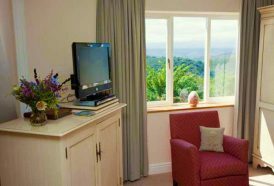 Although our cottages are fully equipped for self catering, breakfasts and dinners are available by arrangement in our Country House. Meals can also be supplied to the cottages. Virgilia comprises of a spacious lounge/dining area, a bedroom area with a king-size bed, a bathroom with bath and separate shower and a fully equipped kitchen for self catering guests. Breakfast and dinner are available by arrangement in the Country House. Awake in this romantic haven to see the sun rising over the majestic Tsitsikamma Mountains! 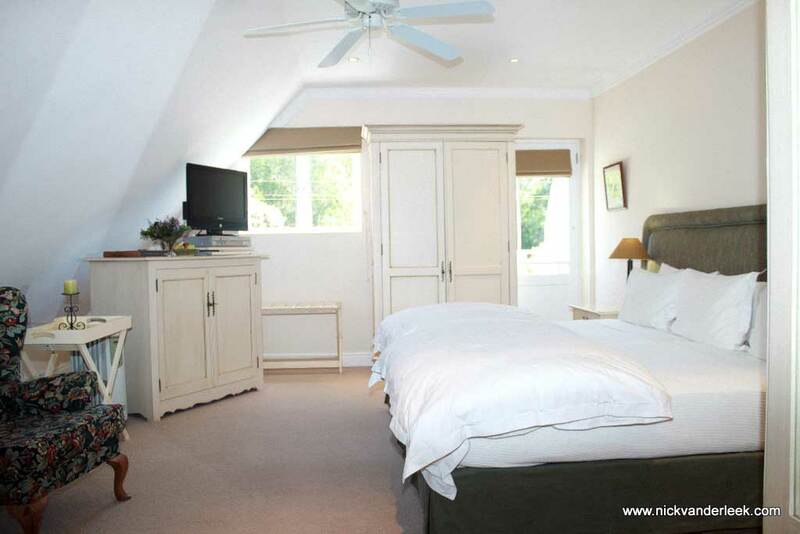 This north facing cottage comfortably accommodates up to 5 self catering or bed and breakfast guests. 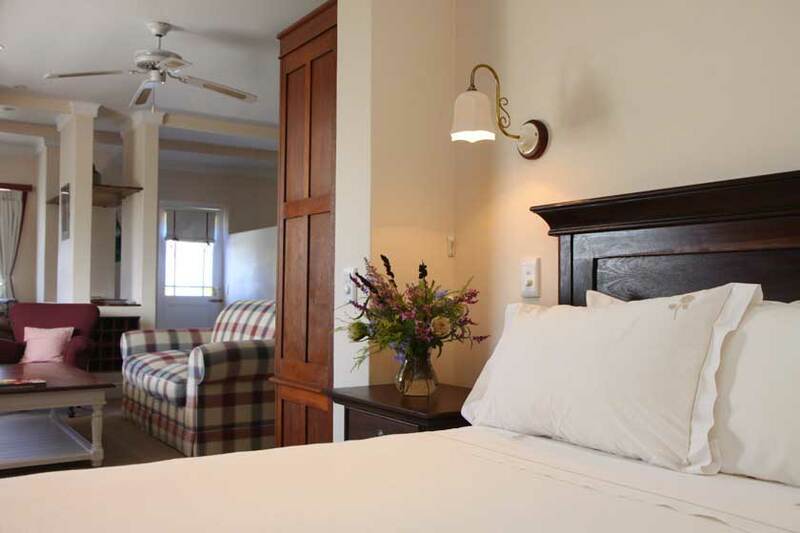 The main bedroom has a king-size bed, a log fireplace and French doors opening onto the patio. Savour the peace and tranquility in a stone bathtub in your en suite bathroom. 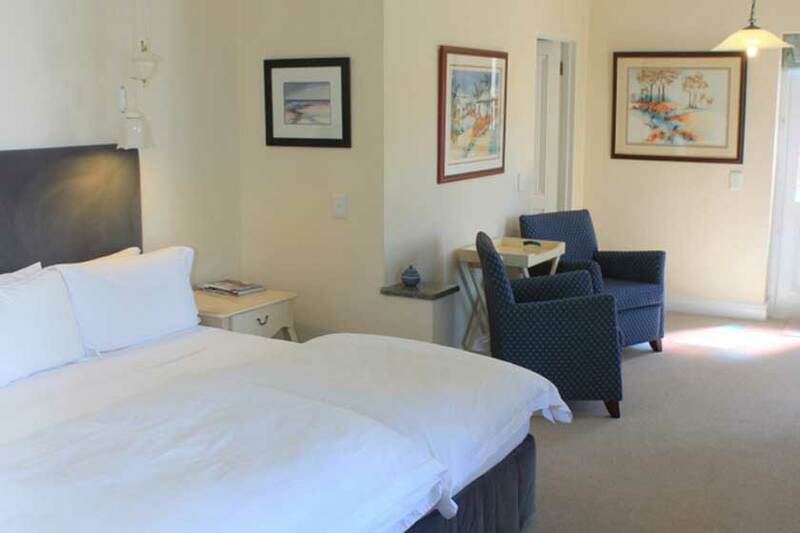 The second bedroom has 2 single beds and a shower room. The spacious and comfortable sitting room has a cosy log fire, DSTV and DVD player. The patio has a built-in barbecue and offers uninterrupted panoramic views. 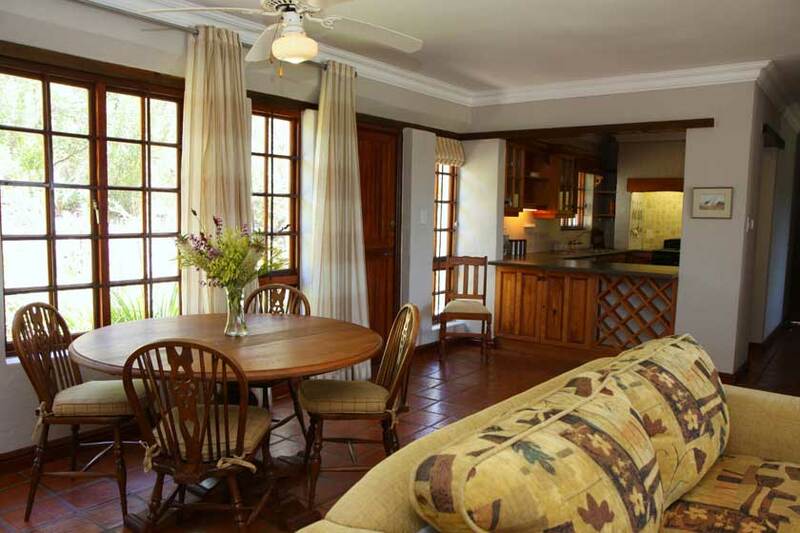 Clivia cottage is north/west facing and decorated with touches of the peach colours of the Clivia flower, with dining table and chairs hand-crafted from indigenous Yellowwood. 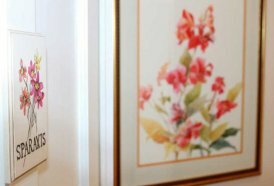 On hot days the ceiling fans in the lounge and bedrooms provide a natural alternative to air conditioning. The enclosed garden leading from the main bedroom is an ideal sanctuary for guests who are seeking perfect tranquility. 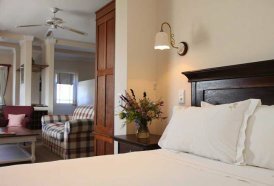 The main bedroom has a king-size bed, its own log fireplace and French doors opening onto the patio. 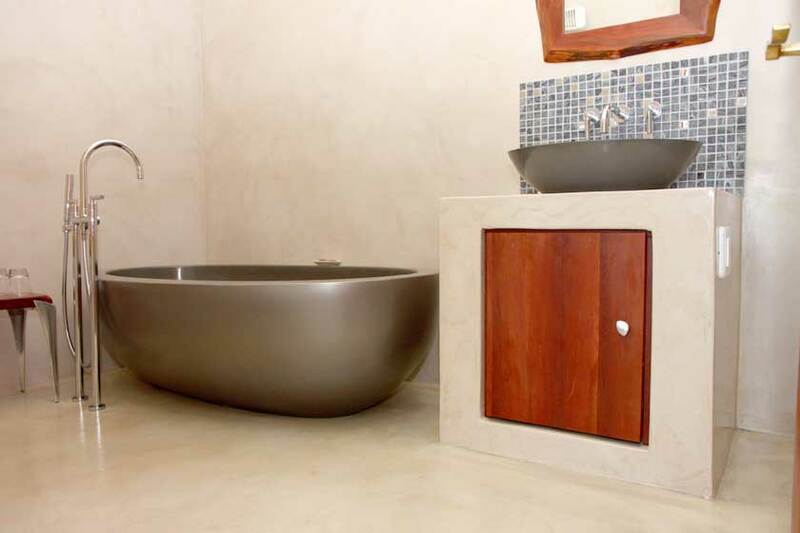 Savour the peace and tranquility whilst soaking in the stone bathtub in the en suite bathroom. 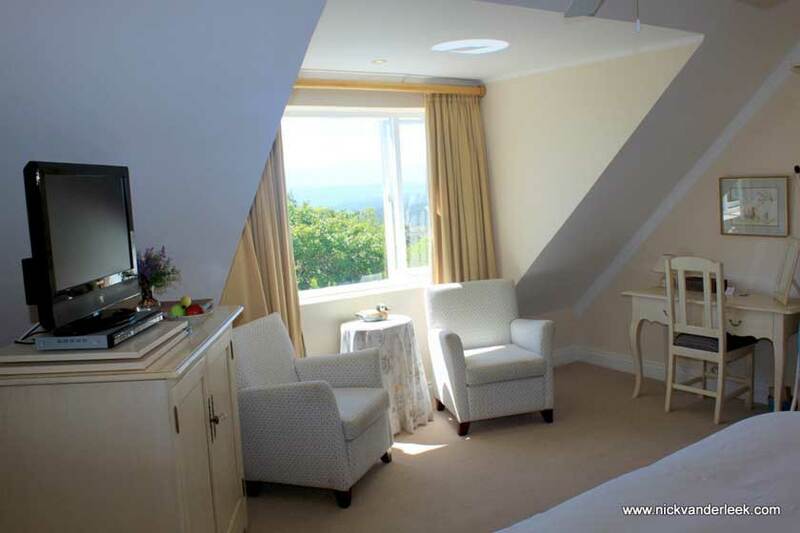 The second bedroom has a shower room, 2 single beds and spectacular mountain views. 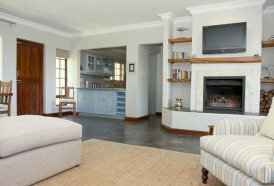 The spacious open-plan living area, with log fire, DSTV and DVD player, leads onto the patio with its own built-in barbecue. The most common form of the Gazania flower is yellow, and this is reflected in the sunny tones of the cottage's interior. 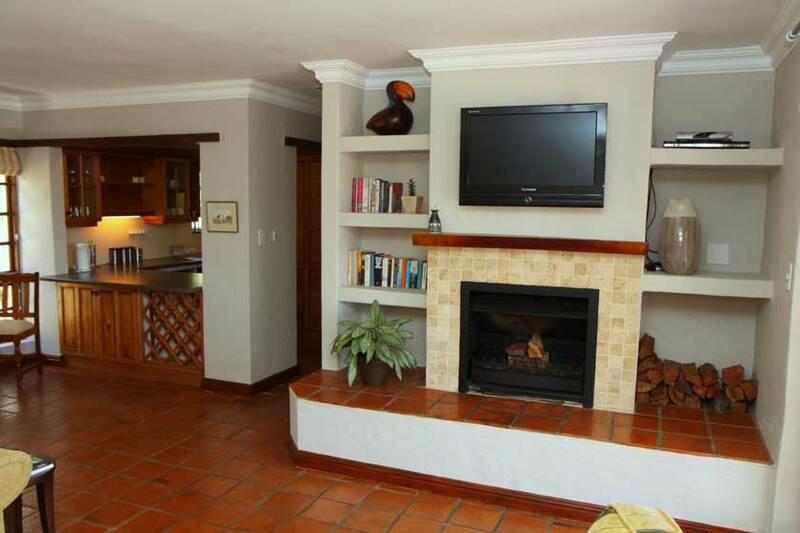 The extended patio is an ideal place from which to savour the sunrise over the majestic Tsitsikamma mountains or to enjoy a sundowner next to the built-in barbecue. 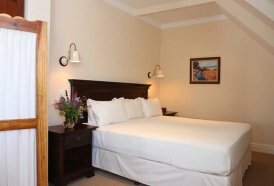 The main Gazania bedroom has a king-size bed, en suite bathroom and its own fireplace, and French doors opening onto a north- facing private patio. 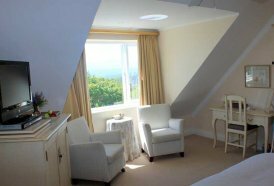 The cosy second bedroom has 2 single beds and spectacular mountain views. The spacious open-plan living area, with log fire, DSTV and DVD player, leads through French doors onto the secluded patio. Enjoy spectacular mountain views as you barbecue on the vine covered patio. The well appointed kitchen will satisfy even the gourmet cook.